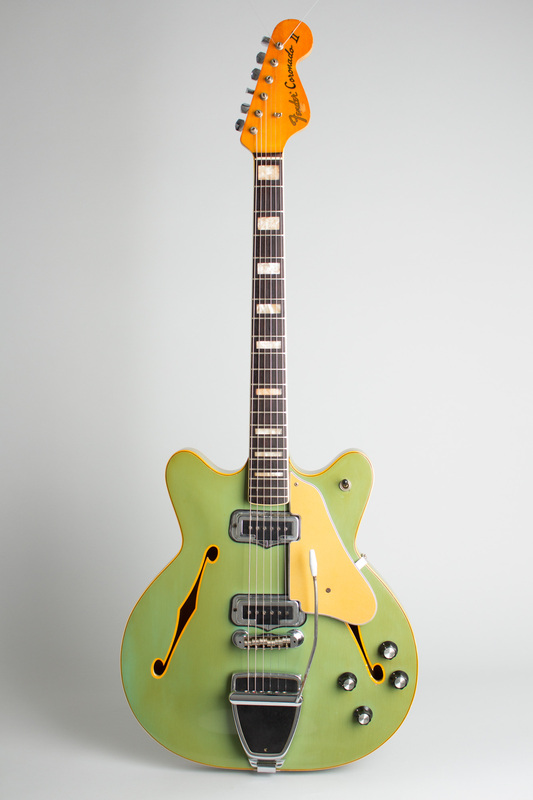 Fender Coronado II Model Thinline Hollow Body Electric Guitar (1970), made in Fullerton, California, serial # 314355, Sonic Blue finish, laminated maple body, maple neck with rosewood fingerboard, original black chipboard case. 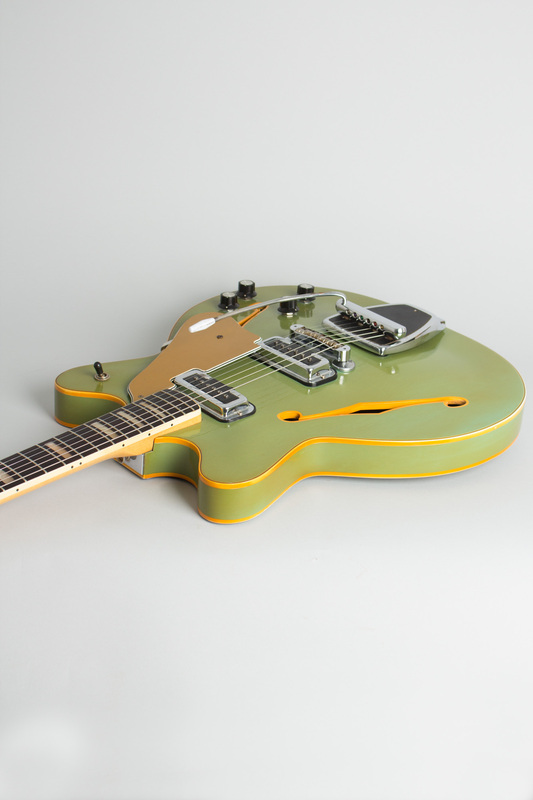 The Coronado models represent the CBS/Fender attempt to challenge Gibson, Gretsch, and Guild in the booming 1960s hollowbody electric market. 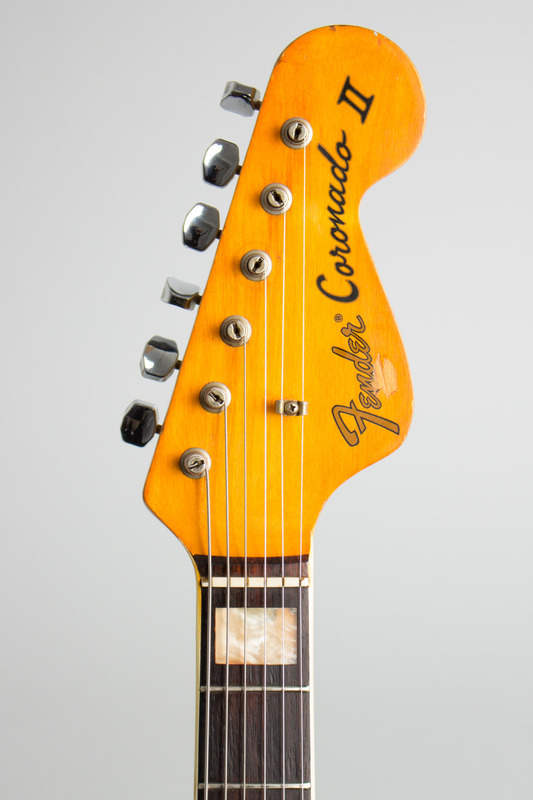 A full line of Coronado guitars and basses was launched in January 1966, about a year after CBS bought the company. 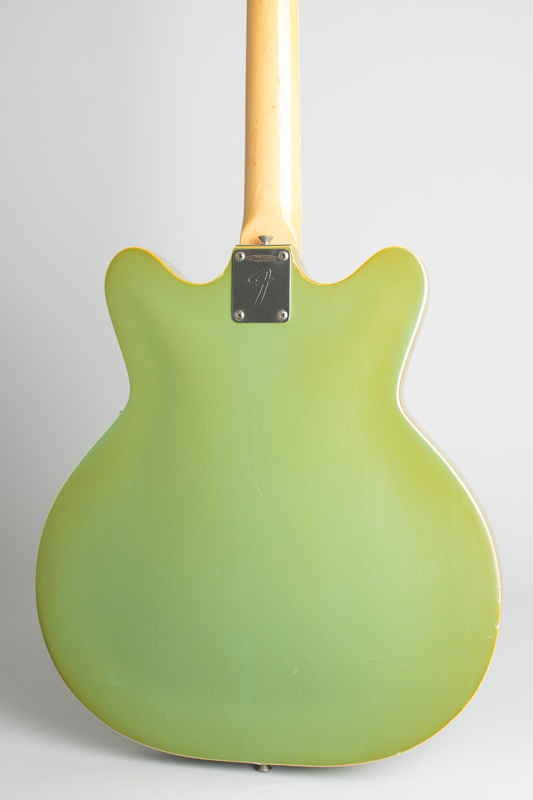 While ultimately not a big hit with either Fender loyalists or players of those other brands, the Coronados were interesting and often very attractive guitars. They were discontinued after 1970; while not extreme rarities, nice examples are not especially common today. 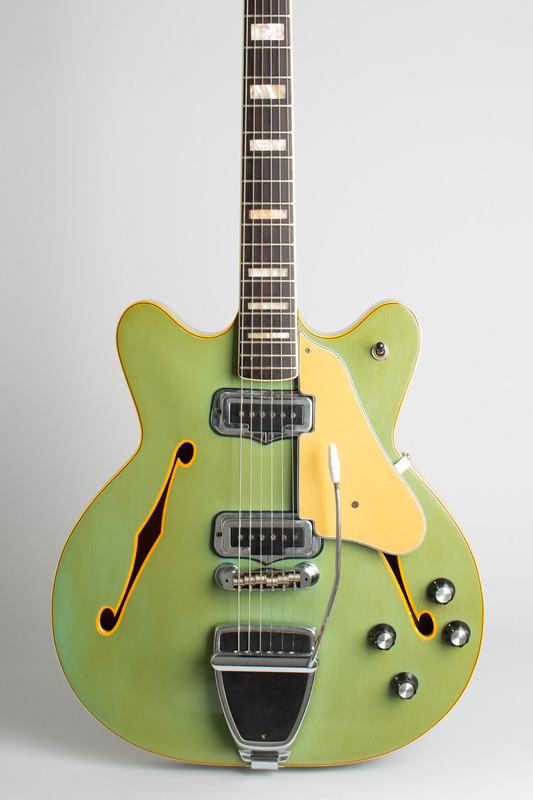 This late-model Coronado II was likely shipped towards the end of the run. It mates a bound, block-inlaid Fender neck to a double cutaway, fully hollow body with triple-bound edges and bound f-holes. There is no neck date, but it is marked in neck pocket with the assembler's stamp "L Crawford...B-802". The twin pickups are not typical Fender units but were sourced from Rowe industries, makers of the DeArmond line. 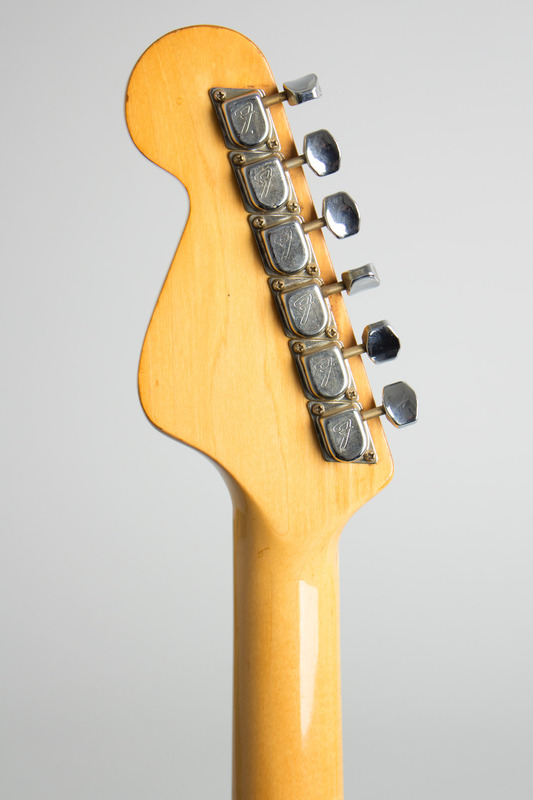 The long-handled Vibrato in this guitar is similar to the Mustang "Dynamic Tension" unit but mounted on a large floating baseplate. The most striking feature of this particular guitar is a lovely Sonic blue lacquer finish that has faded to a pale aqua shade over time. This is a good-playing and sounding guitar, far better than its original reputation suggests, and in its pale oceanic hue a striking instrument too behold. Overall length is 41 1/4 in. (104.8 cm. ), 16 5/16 in. (41.4 cm.) wide at lower bout, and 1 11/16 in. (4.3 cm.) in depth, measured at side of rim. Scale length is 25 1/2 in. (648 mm.). Width of nut is 1 5/8 in. (41 mm.). 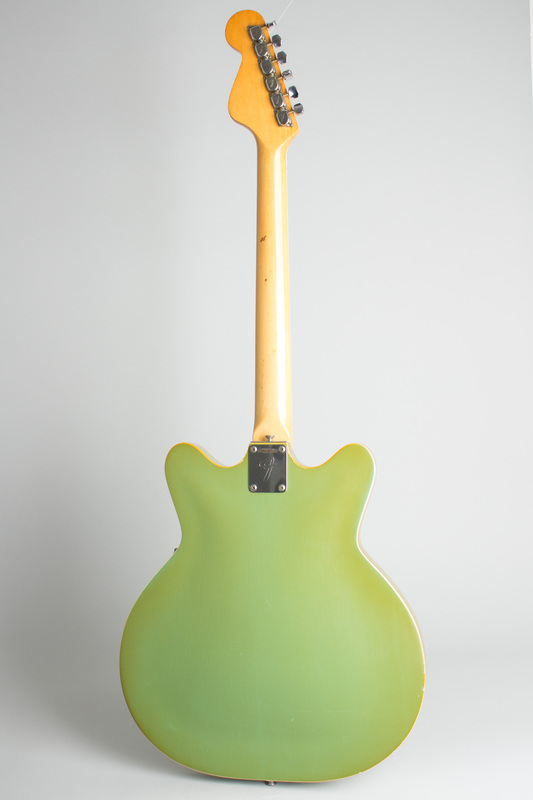 This is a nicely original guitar, with only some fairly light wear. It appears all original except for the pickguard bracket screws. The only alteration is some rather inept thief at some point tried to remove the serial number by grinding it off the plate; they did not fully succeed, and it is still fairly legible. 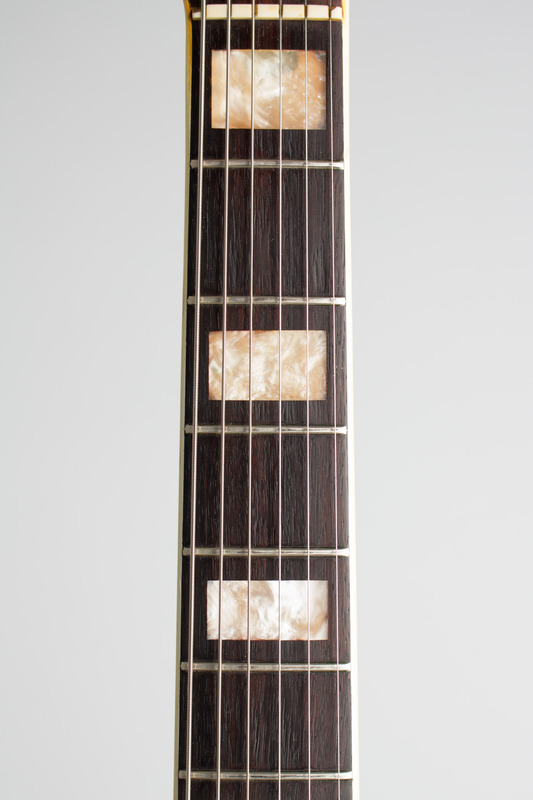 Unfortunately, they also removed the patent numbers from the headstock decal, so the wood has a small scar there. The lovely lacquer finish has only some very small chips and dings with some light checking. The guitar plays well and is complete in its original heavy chipboard case, which is solid with a replaced handle. Excellent - Condition.